The domain within your query sequence starts at position 516 and ends at position 572; the E-value for the Int_alpha domain shown below is 4.9e-13. Integrins are cell adhesion molecules that mediate cell-extracellular matrix and cell-cell interactions. 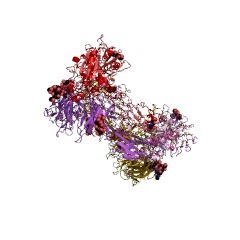 They contain both alpha and beta subunits. 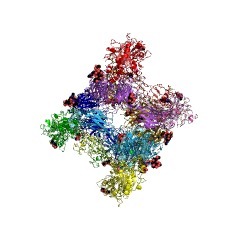 Alpha integrins are proposed to contain a domain containing a 7-fold repeat that adopts a beta-propellor fold. 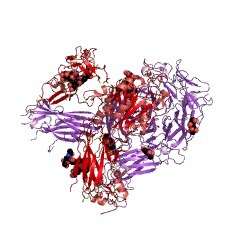 Some of these domains contain an inserted von Willebrand factor type-A domain. 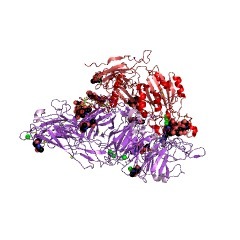 Some repeats contain putative calcium-binding sites. The 7-fold repeat domain is homologous to a similar domain in phosphatidylinositol-glycan-specific phospholipase D.
There are 70993 Int_alpha domains in 14903 proteins in SMART's nrdb database. Taxonomic distribution of proteins containing Int_alpha domain. This tree includes only several representative species. The complete taxonomic breakdown of all proteins with Int_alpha domain is also avaliable. Click on the protein counts, or double click on taxonomic names to display all proteins containing Int_alpha domain in the selected taxonomic class. 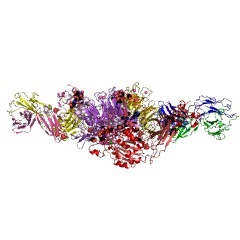 The structure of the beta-propeller domain and C-terminal region of the integrin alphaM subunit. Dependence on beta subunit association and prediction of domains. 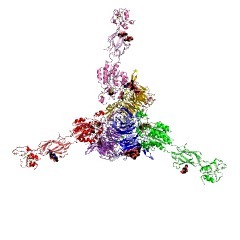 The alphaM subunit of integrin Mac-1 contains several distinct regions in its extracellular segment. The N-terminal region has been predicted to fold into a beta-propeller domain composed of seven beta-sheets each about 60 amino acid residues long, with the I-domain inserted between beta-sheets 2 and 3. 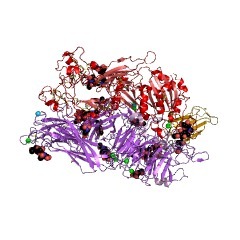 The structure of the C-terminal region is unknown. 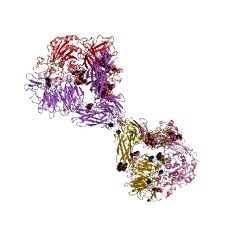 We have used monoclonal antibodies (mAbs) as probes to study the dependence of the structure of different regions of the alphaM subunit on association with the beta2 subunit in the alphaM/beta2 heterodimer. All of the mAbs to the I-domain immunoprecipitated the unassociated alphaM precursor and reacted with the alphaM subunit expressed alone on the surface of COS cells. 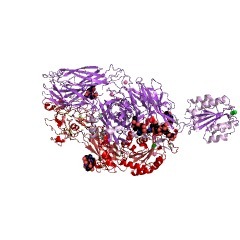 By contrast, four mAbs to the beta-propeller domain did not react with the unassociated alphaM precursor nor with the uncomplexed alphaM subunit expressed on COS cell surface. 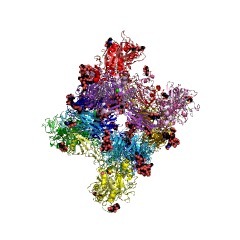 The four mAbs were mapped to three subregions in three different beta-sheets, making it unlikely that each recognized an interface between the alpha and beta subunits. These results suggest that folding of different beta-propeller subregions is coordinate and is dependent on association with the beta2 subunit. 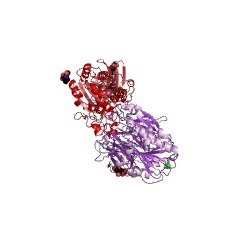 The segment C-terminal to the beta-propeller domain, residues 599-1092, was studied with nine mAbs. A subset of four mAbs that reacted with the alphaM/beta2 complex but not with the unassociated alphaM subunit were mapped to one subregion, residues 718-759, and five other mAbs that recognized both the unassociated and the complexed alphaM subunit were localized to three other subregions, residues 599-679, 820-882, and 943-1047. 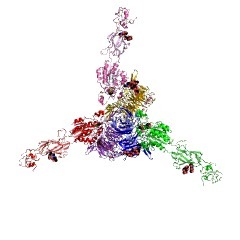 This suggests that much of the region C-terminal to the beta-propeller domain folds independently of association with the beta2 subunit. 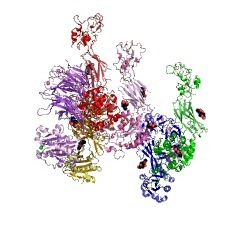 Our data provide new insights into how different domains in the integrin alpha and beta subunits may interact. Integrators of epidermal growth and differentiation: distinct functions for beta 1 and beta 4 integrins. Mammalian epithelia are critically dependent on interactions with components in the underlying basal lamina for proper morphogenesis and function. Substratum attachment is essential for survival, proliferation, movement, and differentiation; detachment compromises the cell's ability to perform these functions, often resulting in human disease. Interactions with the extracellular matrix are mediated through transmembrane integrin receptors that transmit signals to the cytoskeleton and to signaling molecules within the proliferating cells of the epithelium. In the past year, novel insights have emerged regarding the specific role of integrins in their attachment to extracellular matrix and in their signal transduction pathways within the epidermis. Integrin signaling: specificity and control of cell survival and cell cycle progression. Integrin-mediated adhesion to the extracellular matrix plays an important role in regulating cell survival and proliferation. There is now increasing evidence that integrins activate shared as well as subgroup-specific signaling pathways. The signals from these adhesion receptors are integrated with those originating from growth factor and cytokine receptors in order to organize the cytoskeleton, stimulate mitogen-activated protein kinase cascades, and regulate immediate early gene expression. The repertoire of integrins and composition of the extracellular matrix appear to dictate whether a cell will survive, proliferate or exit the cell cycle and differentiate in response to soluble factors. 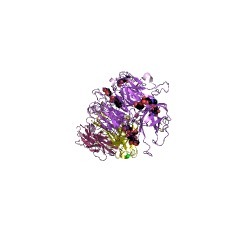 Folding of the N-terminal, ligand-binding region of integrin alpha-subunits into a beta-propeller domain. 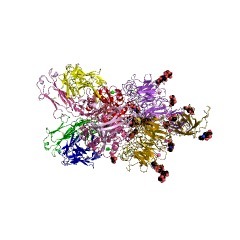 The N-terminal approximately 440 aa of integrin alpha subunits contain seven sequence repeats. These are predicted here to fold into a beta-propeller domain. A homologous domain from the enzyme phosphatidylinositol phospholipase D is predicted to have the same fold. The domains contain seven four-stranded beta-sheets arranged in a torus around a pseudosymmetry axis. 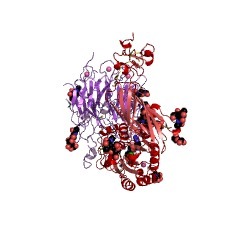 The trimeric G-protein beta subunit (G beta) appears to be the most closely related beta-propeller. 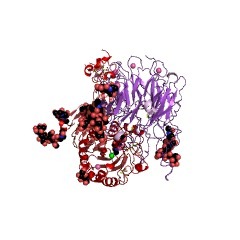 Integrin ligands and a putative Mg2+ ion are predicted to bind to the upper face of the beta-propeller. This face binds substrates in beta-propeller enzymes and is used by the G protein beta subunit to bind the G protein alpha subunit. 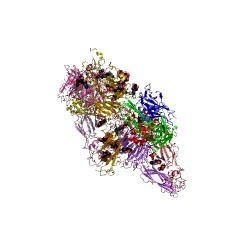 The integrin alpha subunit I domain, which is structurally homologous to the G protein alpha subunit, is tethered to the top of the beta-propeller domain by a hinge that may allow movement of the domains relative to one another. 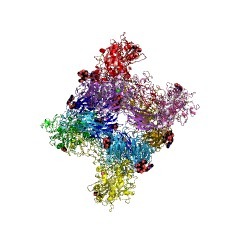 The Ca2+-binding motifs in integrin alpha subunits are on the lower face of the beta-propeller. Structural basis of integrin-mediated signal transduction. 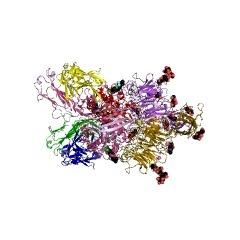 Integrins are a family of alpha/beta heterodimers of cell adhesion receptors that mediate cell-extracellular matrix and cell-cell interactions. 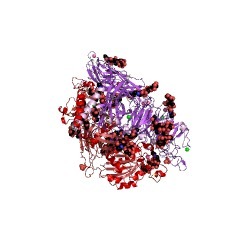 Both alpha and beta subunits have a large extracellular domain and a short cytoplasmic domain. 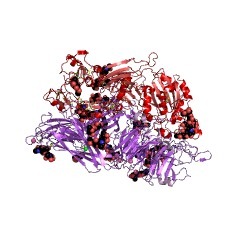 The alpha subunit has seven sequence repeats of 60-70 residues in its N-terminal region. The beta-propeller model, in which seven four-stranded beta-sheets are arranged in a torus around a pseudosymmetry axis, has been proposed as a structural model of these seven repeats. Several predicted loops critical for ligand binding have been identified in the upper face of the proposed beta-propeller model. Several alpha subunits (e.g., alpha 2, alpha L and alpha M) have I-domains of about 200 residues inserted between their second and third repeats. These I-domains adopt a Rossman-fold structure and have major ligand and cation binding sites (the MIDAS site) on their surfaces. 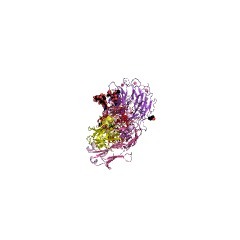 The beta subunit has an I-domain-like structure in its N-terminal region. 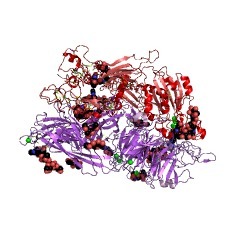 This structure includes multiple sequences/conserved oxygenated residues critical for ligand binding (e.g., Asp-119 in beta 3), and non-conserved residues critical for ligand specificities. 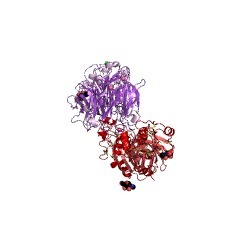 Several "activation-dependent" epitopes have been identified in the Cys-rich (stalk) region of beta 1. It has yet to be determined how these multiple ligand binding sites in the alpha and beta subunits are involved in ligand binding, and how conformational changes on activation/ligand occupancy relate to signal transduction. Integrins are a family of adhesion receptors used by cells to interact with their extracellular matrix. Integrins also function as signaling receptors, integrating information from the extracellular matrix and other environmental cues including growth factors and hormones. Signals triggered by integrins direct cell adhesion and regulate other aspects of cell behavior including cell proliferation and differentiation, and determine cell survival. 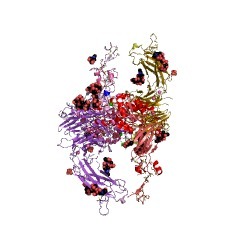 The biochemical pathways initiated by integrin engagement are now being identified. 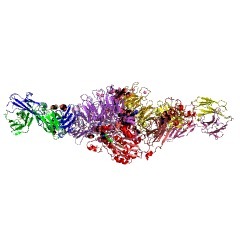 Integrins are receptor molecules for extracellular matrix molecules (e.g., the beta(1) family), serum components (alpha(v) family) and immunoglobulin family adhesion molecules (beta(2) family). Integrin-dependent adhesion has also been shown to have metabolic consequences. Adhesion to a variety of extracellular matrix proteins, such as fibronectin, collagen, and laminin, is a potent regulator of cell growth, differentiation, and gene expression. Ligand binding or aggregation of integrin receptors initiates a number of metabolic changes including activation of serine/threonine and tyrosine kinases, increased Ca2+ influx, increased cytoplasmic alkalinization, and altered inositol lipid metabolism. In some instances activation of transcription factors and induction of gene expression have also been demonstrated. 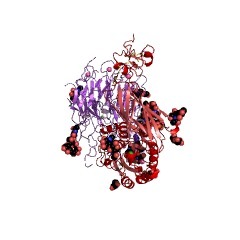 Components of key signaling pathways involving integrins are beginning to be identified. Some studies have shown that integrins form multi-component complexes with signal transduction molecules. 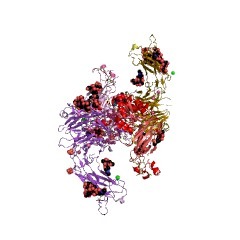 Elucidating the interactions of the signal transduction molecules with each other and with the integrin cytoplasmic domains will be key to understanding the initial events of signal transduction through the integrins. The integrin family was originally described as a family of adhesion receptors, utilized by cells for attachment to and migration across components of the extracellular matrix. Epithelial cells in adult tissues are generally stationary cells, but these cells nevertheless express several different integrins. This review will discuss the evidence that integrins on epithelial cells are also likely to function as signaling molecules, allowing these cells to detect attachment or detachment, and changes in the local composition of ligands. Signals initiated by integrins appear to modulate epithelial cell differentiation, proliferation, survival, and gene expression. Because the local concentration of integrin ligands is altered by injury, inflammation, and remodeling, signals initiated through integrins are likely to play important roles in the responses of epithelial cells to each of these processes. Integrins and signal transduction pathways: the road taken. Adhesive interactions play critical roles in directing the migration, proliferation, and differentiation of cells; aberrations in such interactions can lead to pathological disorders. These adhesive interactions, mediated by cell surface receptors that bind to ligands on adjacent cells or in the extracellular matrix, also regulate intracellular signal transduction pathways that control adhesion-induced changes in cell physiology. Though the extracellular molecular interactions involving many adhesion receptors have been well characterized, the adhesion-dependent intracellular signaling events that regulate these physiological alterations have only begun to be elucidated. This article will focus on recent advances in our understanding of intracellular signal transduction pathways regulated by the integrin family of adhesion receptors. Primary structure and functional activity of a phosphatidylinositol-glycan-specific phospholipase D.
A phosphatidylinositol-glycan-specific phospholipase D (PI-G PLD) that specifically hydrolyzes the inositol phosphate linkage in proteins anchored by phosphatidylinositol-glycans (PI-Gs) has recently been purified from human and bovine sera. The primary structure of bovine PI-G PLD has now been determined and the functional activity of the enzyme has been studied. Expression of PI-G PLD complementary DNA in COS cells produced a protein that specifically hydrolyzed the inositol phosphate linkage of the PI-G anchor. Cotransfection of PI-G PLD with a PI-G-anchored protein resulted in the secretion of the PI-G-anchored protein. The results suggest that the expression of PI-G PLD may influence the expression and location of PI-G-anchored proteins. Purification and characterization of glycosyl-phosphatidylinositol-specific phospholipase D.
We have developed a simple immunoaffinity chromatography procedure for the purification of a glycosyl-phosphatidylinositol (GPI)-specific phospholipase D (GPI-PLD) from bovine serum. 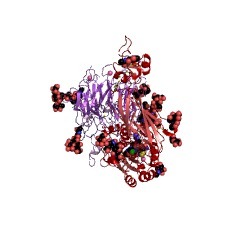 The enzyme was initially purified by a procedure consisting of 9% polyethylene glycol precipitation, Q Sepharose anion-exchange chromatography, S-300 gel filtration, wheat germ lectin-Sepharose, hydroxylapatite agarose, zinc chelate matrix, Mono Q-high performance liquid chromatography (HPLC), and Superose 12 (gel filtration) HPLC. Using this purified material as immunogen, we generated a panel of monoclonal antibodies. 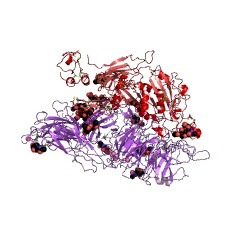 A low affinity antibody was selected for the purification of catalytically active GPI-PLD from bovine serum by immunoaffinity chromatography, followed by wheat germ lectin-Sepharose and Mono Q-fast protein liquid chromatography. The latter method provides a simple purification procedure with an overall yield of 26%. The purified enzyme has an apparent molecular weight of about 100,000 by sodium dodecyl sulfate-polyacrylamide gel electrophoresis and a pI of about 5.6 by isoelectric focusing gel analysis. On Superose 12 HPLC, the material purified by the latter method elutes as a single peak with an apparent molecular weight of 200,000 as determined by protein standards. The enzyme activity is inhibited by [ethylenebis(oxyethylenenitrilo)]tetraacetic acid or 1,10-phenanthroline. Phosphatidic acid is the only 3H-labeled product when [3H]myristate-labeled variant surface glycoprotein is hydrolyzed by the purified enzyme. Amino terminal sequence analysis of the intact 100-kDa protein reveals no strong homology to that of any other known protein. Twelve tryptic peptides derived from the intact protein have been subjected to amino acid sequence analysis. Two of them share sequence homology with each other and with the metal ion binding domains of members of the integrin family. Based upon these criteria, it appears that the purified enzyme is distinct from other phospholipases with specificity for inositol phospholipids. SwissProt sequences and OMIM curated human diseases associated with missense mutations within the Int_alpha domain. This information is based on mapping of SMART genomic protein database to KEGG orthologous groups. 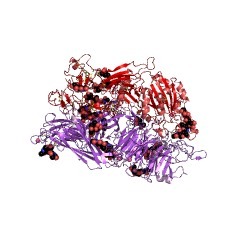 Percentage points are related to the number of proteins with Int_alpha domain which could be assigned to a KEGG orthologous group, and not all proteins containing Int_alpha domain. Please note that proteins can be included in multiple pathways, ie. the numbers above will not always add up to 100%. 4g1e Crystal structure of integrin alpha V beta 3 with coil-coiled tag. 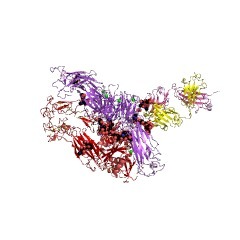 4o02 AlphaVBeta3 integrin in complex with monoclonal antibody FAB fragment.